In 1995, there was a Batman movie, “Batman Forever,” in which one of the central villains, the Riddler, places these brainwave devices over the TVs to gain control of Gotham. The sad part, according to a recent study (J Zhao et al. J Pediatr 2018; 202; 157-62) is there is no need to add a brainwave device to a TV set. Excessive screen time alone is quite detrimental. Mean screen time for preschool children was 2.8 hrs per day. 78.6% exceeded 1 hour per day and 53% exceeded 2 hrs per day. 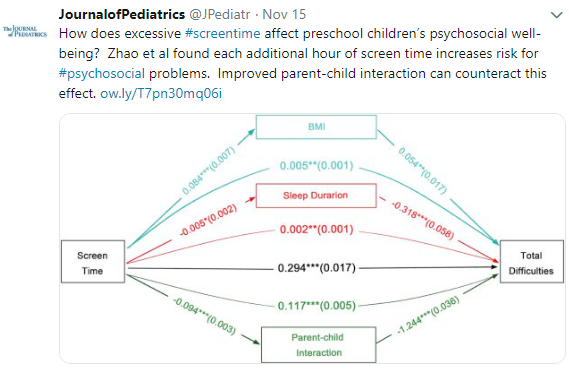 Every additional hour of screen time was associated with increased risk for poor psychosocial well-being; this effect on well-being had a number of mediators including reducing parent-child interaction as well as increased body mass index and reduced sleep duration. My take: This study reinforces the consequences of excessive screen time –now, the hard part — how to translate these findings into reduction in screen time. This entry was posted in General Health, Nutrition and tagged body mass index, screentime, TV by gutsandgrowth. Bookmark the permalink.